After high school I studied dietetics at University of Nebraska-Lincoln, interned at University of Nebraska Medical Center and then earned my Masters at the University of Nebraska-Omaha. After 22 years cooking on local TV for the Dairy Council, I "retired" in 2008. My husband Jeff is with Mutual of Omaha Bank. His work involves travel, so I join him. My guilty pleasures are Pilates, listening to 1970's music, cheering on the Huskers, traveling and trying new restaurants. My folks, Helenann and Bob Cox continue to live in Norfolk in the house I grew up in on Terrace Road. My Dad retired from Northeast Community College, but serves on the Northeast Community College Foundation Board. My mother retired as a dietitian but is active at the Norfolk Arts Center and St. Vincent de Paul Society. Both my folks attend most of the Northeast games and activities. My sister Cathy, (class of '77) lives in northern Minnesota. She and her husband Max have adult 3 children. Cathy teaches preschool in Hibbing Minnesota. My sister Susan (Class of '77) and her husband David live in Tokyo Japan. She teaches at an American school. Their son Isaac attends college in NYC. My brother Joe, (class of '80) is a CPA at HDR in Omaha. Joe and his awesome wife Liz have two children. We are fortunate to hang out a lot with Joe's family since they live in Omaha. My youngest brother Jim, (class of '86) lives in Norfolk and is an attorney working in real estate. I am looking forward to our class reunion. Thanks to the planning committee for all of their hard work making our a reunion a huge success. This web site is awesome. See you all soon and Go Panthers! -Friday Night Lights...Football games, Go Panthers! -Hanging out with my band friends. I am the worst French Horn player ever to march in the NHS band! -Driving main with Julie Bauer in her blue Camero drinking Tab with a lemon Julie Tinius served us at Long John Silvers. Amy Cox Schmid posted a message. Jackie and Mike, I so hope you are coming home to Norfolk to our class reunion over the 4th of July weekend. Wouldn't be the same without you two. Amy Cox Schmid has a birthday today. Amy Cox Schmid updated profile. View. Amy Cox Schmid changed profile picture. My brother Joe Cox with his 4 year old son, Charlie, NHS teacher Ron Bruning, Norfolk native Nick Johnson and Amy Cox Schmid at her son's high school football parent's night. Go Papilllion LaVista South Titans! 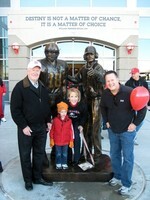 My Dad, Bob Cox, Brother Joe and his son Charlie and me at the Husker game. Go Big Red! My Mom, daughter Abbie and me at the University of Missouri. Abbie is a junior at Mizzou studying Convergence Media and Spanish. My parents 50th wedding anniversary mass in June 2007. L-R My brother Joe, family friend Fr. Jim Egan, Bob and Helen Ann Cox, brother Jimmy (an attorny in Austin Texas), Amy, Abbie, Bobby Jeff, Joe's wife Liz and son Charlie. Joe and Liz also have a 1 1/2 year old darling girl Lauren. Carrie Jensen and me, in 6th grade at Northern Hills during our first days as drama students. Jean Carney and me in 7th grade.